An unsafe upholstered armchair, an old microwave and kitchen cooker, old utensils, chairs and curtains consigned to the rubbish tip. Books in piles on the floor beside framed pictures leaning against walls, all awaiting their fate. The removal van is coming in two days’ time to take away part of our past. Our son is moving and has decided to let his house next door. My most ambitious book which has taken years to write and revise has just been sent to a clutch of liagents. They receive on average a hundred novels a week! Tough competition indeed. I’m desperate to avoid my past mistake when a publisher phoned and in dulcet tones said that she wanted to publish my novel and would like to meet me. I was thrilled. Only after signing the contract did I notice that I was expected to pay ‘a contribution to costs’. (Of course, one should always read the small print!) When I wanted to meet her and turned up after trying to make a phone appointment, she was unavailable. I never saw her and wonder whether she only used the address as an ‘office’ and worked from home. Worse was to come. According to the contract, the publisher was to undertake the publicity. This turned out to be a list of hundreds of bookshops who all received the same brief publication notice. I could almost hear the hundreds of clicks on ‘delete’. Then I was told to do my own publicity, starting locally at Bridlington on a sunny June day when everyone was at the beach, or in an arcade in London where everyone came just for the glass of wine. So this time it must be an agent who should find me a reputable publisher. the Finzi Contini, he was working for the publishing house Feltrinelli when he came across the manuscript rejected by the big Italian publishers – Mondadori and Einaudi. 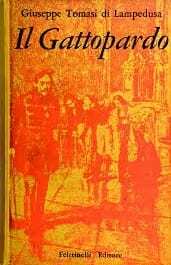 Sadly the Prince of Lampedusa died before Feltrinelli published his only book. The Luchino Visconti film starring Claudia Cardinale and Alain Delon is one of the great films of all times. where some of the film was shot. Only one house was standing after an earthquake, but what remained of the Lampedusa palace was still linked to the church where the family had their reserved balcony, just as it was in the film shot hardly a year earlier. I can still see it now as I write. Unforgettable.